This glass kettle from Gallet will instantly grab your attention with its unique and stylish look. It will be both an eye-catching and functional kitchen accessory. 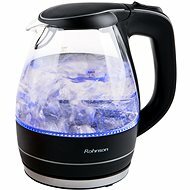 The internal blue lighting will allow you to really enjoy and appreciate what actually happens in your kettle as the water boils. The effect is sure to be captivating. 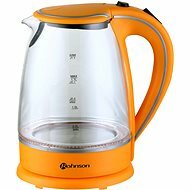 Because the glass is transparent, you will clearly be able to see how much water is in the kettle, which will ensure that you don't boil unnecessary amounts of water. The materials used will ensure that your water will remain pure, healthy and free from toxins and impurities. Because of this, the Gallet BOU 742 compares favourably to many other kettles that are on the market. 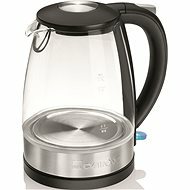 With 2200W of power, this kettle will bring your water to the boil in no time at all. The kettle's spout features a filter strainer, which will prevent any limescale from getting into your drink. The unusually large diameter of the kettle's opening allows for easy and convenient access to the inside of the kettle for cleaning purposes. A hidden heating element under the flat stainless steel bottom will allow for easy maintenance. There is also space in the stand, which makes it easy to set the length of the power cord according to your needs. A safety fuse, a washable water filter and an automatic shutdown feature are also included. Operation indicator, Hidden spiral, Filter, Automatic Shutdown, Overheat protection Done! For shipping to other EU countries visit this page Gallet BOU 742. Für Versand nach Deutschland, besuchen Sie bitte Gallet BOU 742. Chcete doručit zboží do Česka? Prohlédněte si Gallet BOU 742. Chcete doručiť tovar na Slovensko? Prezrite si Gallet BOU 742. Für Versand nach Österreich, besuchen Sie bitte Gallet BOU 742. Magyarországra történő kiszállításért tekintse meg ezt a termékoldalt: Gallet BOU 742.